2. Mai 2017 Ingrid KrauseVisit BremenBudgettraveller..
Do you feel like a holiday, but money is tight? 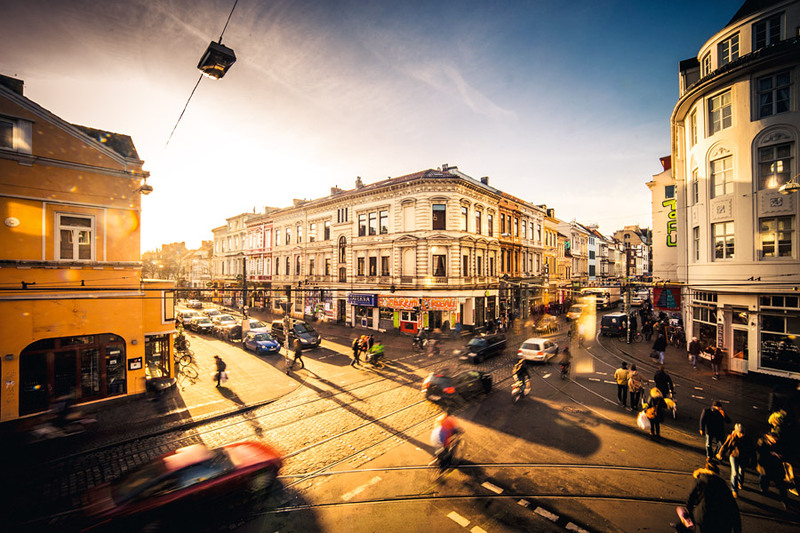 How about a city break on a budget? Fortunately, there’s plenty to do in Bremen that won’t break the bank. „Saturday morning. The first rays of sunshine awaken me gently and my noisy alarm clock stays silent. The smell of coffee. The smell gets stronger – coffee in bed. Perfect. My partner and I wonder what to do today. Something outdoors, in the sunshine, perhaps involving a little exercise. So we start packing – sunglasses, camera, mobile phone, keys, picnic gear and a blanket. But only a little cash. And then we set off on our bikes. We head towards Schlachte Embankment, stroll past the flea market stalls and sit down on the steps. People watching and checking out the hustle and bustle on and around the Weser river. 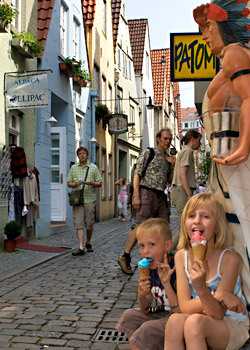 We grab an ice cream at the kiosk, that’s not a luxury too far, then it’s off on foot into the city centre. I remember telling my partner about the Cathedral Museum and that it’s only open until noon on Saturdays. So we check out the church for free. We cycle onwards to Überseestadt to see what’s going on there. Oh, look, another new building! The Überseestadt district is growing fast and looks different every time I’m here. Then a stop-off at Schuppen Eins, where we cool down surrounded by the cool classic cars on display here. Day-dreaming of hopping into a VW camper van and heading to Italy. Or to Spain, maybe? No, we’ll stay in Bremen, there’s no place quite like it! A break would be nice, and my stomach’s rumbling. So it’s off to the huge Bürgerpark for a small picnic. A little nap afterwards feels well deserved. At some point my partner pinches me as he’s keen to carry on. Everything packed up and off towards the Ostertor quarter. We leave our bikes at the river and take the ferry on foot, which is also cheaper. On the other side, we can’t resist the sandy beach. The blanket comes out again. We enjoy some fries with ketchup and mayo, a must-do whenever you visit Café Sand. 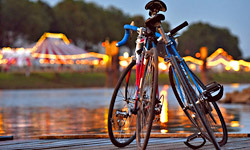 Flat terrain, leafy paths and plenty to see – it comes as no surprise that Bremen is very popular with cyclists, particularly as everywhere is really quick and easy to get to. We’ve put together a couple of interesting routes for you. 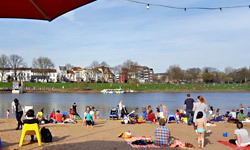 You can enjoy the varied scenery in Bremen along the Weser Cycle Route, travel through the lush Blockland region or take the five rivers photo tour. 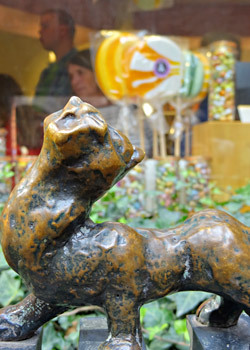 If you prefer to get around on foot, check out Ingrid’s tips on walking in the city, or explore Bremen’s seven ‚miles‘. Sure, Bremen has great museums, science centres, theatres, cabarets and plenty more. But if you want to enjoy culture for free, you should check out the many artworks on display in public places. There’s also some cool street art to admire. 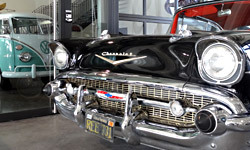 Petrol heads will love the classic cars that are on show all year round in Schuppen Eins. And it’s free to get in! Click here to find out more. Need to cool off on a hot summer’s day? 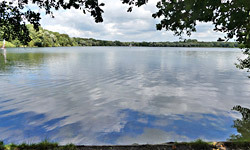 Then why not take a dip in one of Bremen’s many swimming lakes. Click here to see our tips. The trees in Bremen’s Bürgerpark offer plenty of cool shade, and there’s a small zoo for the little ones to enjoy. Beautiful blossom can be seen in Rhododendron Park, and we’ve captured it on film in all its glory. No trip to Bremen is complete without a visit to the Weser river. 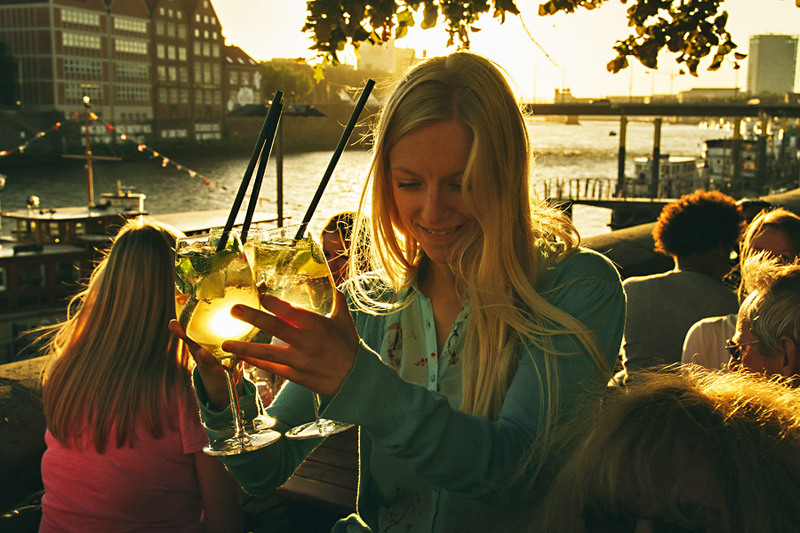 A must-see is Schlachte Embankment with its many beer gardens. 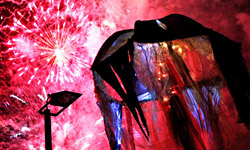 You can even bring your own drinks, sit on the nearby steps and watch the boats and the lapping waters of the river. A little further upstream lies Osterdeich, where there is plenty of room for a picnic on the grass between the street and the river – but please clean up after yourself! 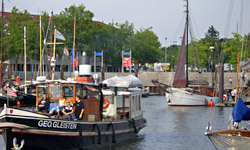 Bremen’s ‚maritime mile‘ can be found in Vegesack along the museum harbour, which is also the oldest man-made harbour in Europe. Large information boards tell stories of the colourful harbour life over the centuries. A more modern take can be found in the redesigned Europahafen in the Überseestadt district. The large seating area at the head of the harbour is a convenient place to watch the comings and goings along the shore and in the marina. Here’s an unusual tip: the fish ladder at the end of Werdersee lake is the favourite spot of our former blogger Theresa. The Hanseatic city of Bremen has a colourful history going back 1,200 years. And you don’t necessarily have to visit a museum or go on a guided tour of the city centre to explore it. 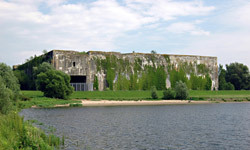 The Valentin site is a ruined U-boat pen that belonged to the German navy at the time of the Second World War. Between 1943 and 1945 thousands of forced labourers from all over Europe were deployed here in Bremen-Farge. A new discovery trail has been opened around and through the site, and there is an extensive memorial centre. The discovery trail around Binnendüne, an inland sand dune, takes you even further back in time to the Bronze Age. As you walk around the low hills of the surrounding area, known as Bremen Switzerland, small boards provide information on the local history and on the Bronze Age artefacts discovered here. If you still want to go on a conventional sightseeing walk, you can download our free audio guide for your tour. Simply follow the markers in the ground all around the city centre and listen to our tour guide on your phone. A walk along the Weser river to Jürgenshof restaurant is always worth your while. You can even stroke donkeys there. Huchting urban farm is a great place for a day out by Lake Sodenmatt in Huchting. The sandy beach at Café Sand is perfect for little ones to play and build sandcastles. The website Familienkultour has a lot of great tips. Rhododendron Park, the sensory garden and the audio guide (also available in a version for children) all get a mention here. So, what else? The cathedral and its museum – who can find the church mouse? Do you have any tips or personal favourites? Tell us all about them below!